Helping you to do something different in clinic on Monday morning! This highly practical course aims to equip you with the clinical skills to appropriately diagnose the most likely source of shoulder pain and to evaluate the contributory factors. This in turn allows you to identify the most likely strategies that will help get the patient better or to know when to investigate or refer onwards. 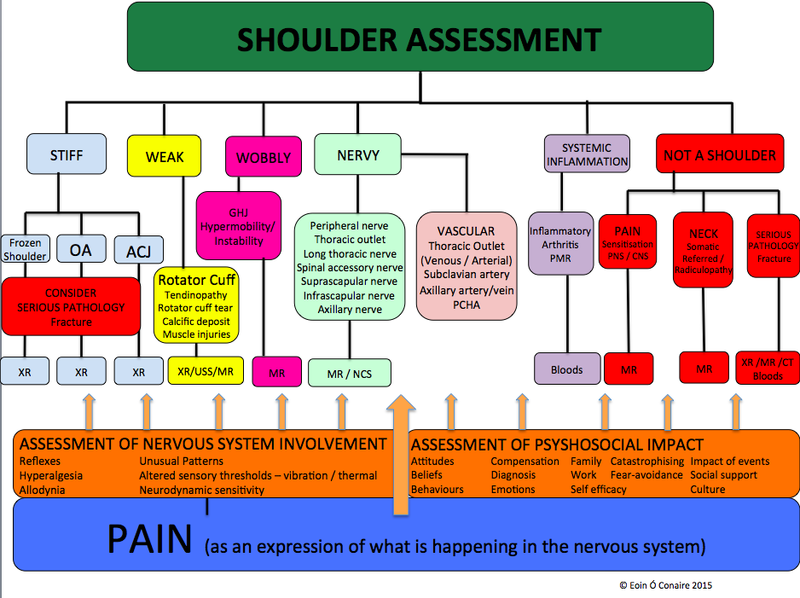 The flow chart below gives a flavour of the complexity of clinical reasoning in the shoulder. Eoin breaks down the clinical reasoning process and integrates traditional structural clinical reasoning with modern pain science in a very practical and clinically accessible way. What have people said are the main strengths of the Shoulder Masterclass? 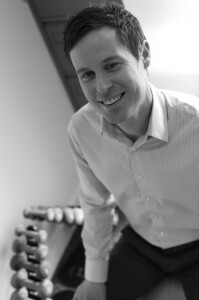 Eoin Ó Conaire is an award-winning chartered physiotherapist and shoulder specialist. Since qualifying from the University of Brighton with first class honours in 1999, he has gathered a huge breadth and depth of experience. This has included working at large London teaching hospitals, professional and elite sport and in private practice. As Musculoskeletal Clinical Lead and lead Extended Scope Practitioner at Central London Community Healthcare, he developed a specialist orthopaedic triage and treatment service and worked clinically in the Upper Limb service. He also set up and ran an ultrasound-guided injection service and in collaboration with Dr. Jeremy Lewis developed and validated the first physiotherapy-led arthrographic hydrodistension service for Frozen Shoulder. In 2011 this was awarded funding from the Health Foundation Shine programme for innovations in healthcare. Academically he has gained an MSc (Advancing Practice) with distinction from the University of Birmingham, been published in peer-reviewed journals and presented his work at international conferences. He was awarded the MACP MSc research prize in 2009 and Central London Community Healthcare therapist of the year in 2011. In 2012 – together with Clinical Psychologist Dr. Róisín Joyce – he set up Evidence-Based Therapy Centre in Galway. They have a shared vision to develop a service which puts into practice the highest quality research evidence. This combined with their clinical expertise and an emphasis on working collaboratively with their patients can provide the best possible outcomes. 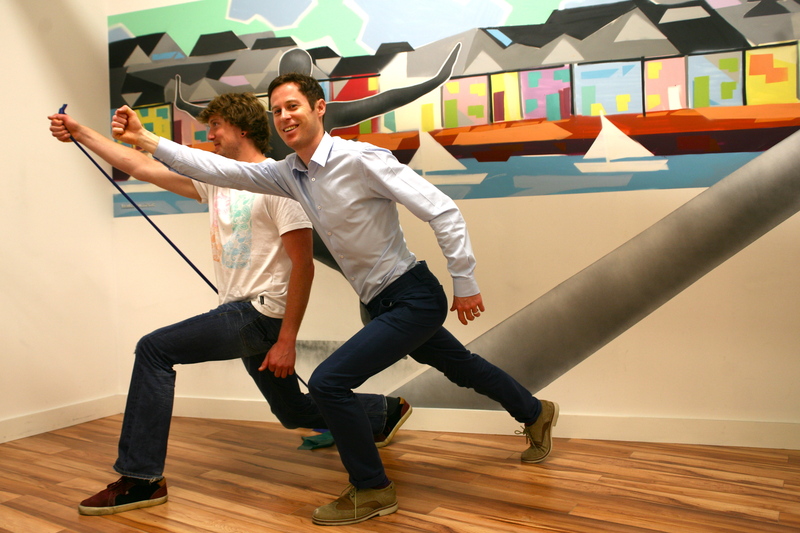 In 2013, Eoin developed the Shoulder Masterclass. This distills his considerable clinical and academic knowledge into a two-day highly practical course to help physiotherapists to improve the management of shoulder pain. The Shoulder Masterclass is aimed at qualified healthcare professionals who see patients with musculoskeletal shoulder pain. Whilst we welcome new graduates on the course, the Shoulder Masterclass primarily targets clinicians who have experience treating patients and would like to improve clinical reasoning and management skills.